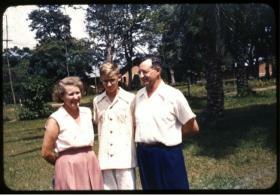 PHOTO: 1955 Bill Lovell and his Mother and Father Eloise and Marshall Lovell standing in front of their home at Wembo Nyama. Photo courtesy of Bill Lovell. 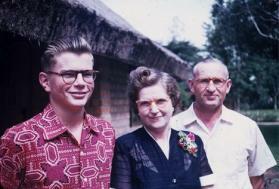 I was 18 months old in 1940 when I arrived in the Belgian Congo, and 18 years old when I returned to America in 1957. My parents, the Rev. Marshall and Eloise Lovell, were missionaries with the Board of Missions of The Methodist Church. My first language was Otetela, a Bantu language spoken in the Kasai Oriental Province in the Democratic Republic of Congo. I still speak the language today. I was influenced by the Otetela culture and moved by the inspirational and vibrant preaching of Otetela preachers. My parents and I visited Tunda where my Uncle (the Rev.) Eugene and Aunt Mildred Lovell and their children lived. Tunda is in the forest region and located near the Lomami River, where wild game and fish were plentiful. Mose Ngandjolo, an evangelist and district superintendent, was traveling to Tunda on his motorcycle one day when a lion began to run after him. When he arrived at Tunda there were marks of the lion’s claws on the back fender of his motorcycle. There was a service of thanksgiving to God for saving his life. I felt God calling me to continue the work my parents and others had begun. The Congolese churches were becoming self-sufficient, relying less and less on financial aid and they were multiplying. The educational system — started and supervised by the church — was producing future leaders of the country and church. The infrastructure of the country was working well, with mail delivery each week, roads that were regularly maintained, daily short wave radio connection with all other mission stations as well as overseas, hospitals serving the needs of people and offering good medical care with pharmacies stocked with essential medications, and dental care. There were also scholarships for the best graduates of high school to go elsewhere for college education. I realized that my call to be a missionary would require that I be prepared to serve alongside the Congolese in different ways than my parents. The Congolese no longer needed preachers as missionaries, they had excellent preachers. But the Congolese church needed a continued partnership with churches in America and Europe in order to meet the goals they set for themselves. My wife, Beverly, and I applied to be missionaries to Congo among the Otetela people while we were attending United Methodist Duke Divinity School in Durham, North Carolina. Because of my background and knowledge of the language, I was not interested in serving as a missionary anywhere else. We were accepted and decided to wait for the hostilities in the Wembo Nyama area to cease before beginning our missionary life in Congo. Our two children were born and the rebels continued to torment the people of the region. Missionaries were all evacuated, including my parents and uncle and aunt. In 1964, my Uncle Eugene Lovell and four other missionaries were held under armed house arrest at Wembo Nyama for 90 days. They were finally evacuated though the help of the United Nations. After all this, we delayed our decision to go to Congo until peace was restored. We decided to support the work of The Methodist Church in Congo by speaking to churches in the Tennessee Annual Conference — where I was to begin my ministry — about the challenges and mission needs in Central Congo. This we have continued to do all these years. When I graduated from High School at Central School for Missionary Children at Lubondai, my uncle and aunt gave me a special gift. They invited me to go with them into the Kivu region of Congo to see an area of Congo I had never seen before. We traveled from Tunda to Bukavu by car making one stop at Shabunda, a mission station of another denomination and at one other place before arriving at this beautiful city on the shores of Lake Kivu. We had a wonderful time together and stopped to enjoy delicious strawberries which could not be grown in our tropical climate, but which were in abundance in the higher elevation of the Kivu area. My relationship with the church in Congo continues with weekly emails, support of the Theological School at Wembo Nyama through the Lovell Memorial Mission Trust Fund of Hermitage United Methodist Church in Hermitage, Tennessee, and through translating for church leaders when they come to Nashville and are invited to speak in churches of the area. My occasional visits to the Democratic Republic of Congo have been times of spiritual renewal for me. On my first visit back in 1987, when Bishop Onema invited me to preach at his three annual conferences, I had to do an extra amount of rehearsal of my sermons in the Otetela language. This involved receiving the assistance of Dr. Marcel Eluhu, a cardiologist in Nashville from Congo, as I went over every word of my sermons with him, so he could help me translate a few words and phrases I had forgotten. Then on the plane to Congo, as all the other passengers were trying to watch the movies, I took out each sermon, from the manila folders, and preached them aloud from my seat so I would become more familiar with the language. I have witnessed the faith, hope, and joy of people who have suffered much, and continue to believe that they are God’s beloved. To be in church in rural areas of Congo, and to hear the words of the extemporaneous prayers in the Otetela language, thanking God for tiny birds waking them up, and lighting up their paths with the light of sun; and thanking God for supplying all their needs. For me, an experience that brings tears to my eyes, as I think about the words I have often used in my prayers. I will always think of the Otetela people as God’s beloved and not forgotten people. News media contact: Kathy Gilbert, Nashville, Tenn., (615) 742-5470 or newsdesk@umcom.org.